Go Hye Mi is a student who had majored in classical music but has to give up her dream by entering Kirin Art High School to pay off her father's debt. However, she needs to get two other students to also come to the school in order for her to enroll in the school conditionally. These two students are Song Sam Dong, who lives in the countryside, and Jin Guk, whom she accidentally meets while trying to escape from a loan shark. Yoon Baek Hee, formerly Hyemi's sidekick, becomes her rival in school because Hye Mi betrays her during an audition to enter the school. Knowing that this drama was produced by JYP and Bae Yong Joon, I was expecting much from it, but unfortunately the first 5 episodes failed me. I have seen a lot of dramas and I have to say that the first few episodes are always the judging point. They should be able to get you hooked and glued. But with this drama, I have to be honest that I was struggling. If it wasn't for TaecYeon (which was the primary reason I watched this) then I would have stopped watching. The story is good and the concept is fresh but they slacked in making the first few episodes creative. So, if you are planning to watch this then you better prepare yourself to get bored at first. 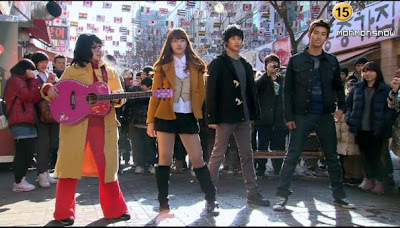 If you are into K-Pop and you follow Korean bands and singers then this drama is definitely for you. Some people do, but I actually don't mind that they didn't get actors rather singers for the drama. I think that was the whole point of it. Having these K-Pop stars act in this drama is basically the highlight. The showcases, performances and some K-Pop song covers are also what you should look out for. Kim Pil Sook's (IU) transformation is also another highlight. She was a talented but fat student who was bullied. She then decides to loose weight in 200 days because she likes Jason (Woo Young) but he sees her as a friend. Teen age stage is where you'll experience first love. In this drama, there were a couple of pairs that were quite interesting. Their stories were not heavy or draggy. And the most exciting part about this is the OST. The songs are good and encouraging. You'll find yourself singing the song over and over once you watch this. Another thing to look forward to is the "Flash Mob" in episode 16. I thought it was so cool and there were even cameo appearances by 2Am and MissA. This story is about realizing your dreams and making your ways to achieve it. You may encounter struggles along the way but you will later realize that those will actually make you stronger. I like that the story is light and though you are not a student anymore or an aspiring singer, you'll get moral lessons from it,too. Song Sam Dong is just so adorable. When I first saw him wearing that trashy costume, I didn't think he was funny. I thought "Oh, this guy is hot. He just needs to cut his hair." And then I think, Hye Mi heard me so he gave him a make over. And he looked more handsome when he cut his hair shorter and pierced his ear. I didn't know IU was so cute until I watched Dream High. She played the role of Pil Sook well and I think there couldn't be any actress fit for the role other than her. I like the adorable "Milk" couple Kim Pil Sook and Jason. Unlike Sam Dong. Hye Mi, Jin Guk and Baek Hee who had complicated relationships, the sushi couple were always cute! I comfortably sit while watching but I always pay close attention every time the couple is in the scene. They didn't have heavy and dramatic scenes which I think was good. They were the breath of fresh air in this drama. I totally fell in love with them. Their teachers were also inspiring. If I had teachers like them when I was in high-school then I'm sure I would have been a singer,too. You can really feel their passion and their love for their students. I thought Teacher Kang wasn't going to be successful in molding the kids since he looked like an underdog. But his style is not fierce. He uses positive reinforcement in dealing with his students and that's the reason why they love him so much. Teacher Shi seemed liked a bad person at first, especially because she likes wearing black outfits. (lol, that was kind of a lame reason to judge someone, huh?) Since Baek Hee became bad, I thought Teacher Shi was going to make her even more bad. But I was wrong. I like that Teacher Shi always sticks to what is good and righteous to do, no matter who does it. 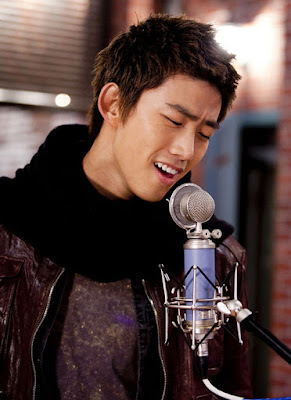 And what I like most about this story is Taecyeon! ^__^ His acting was really good. 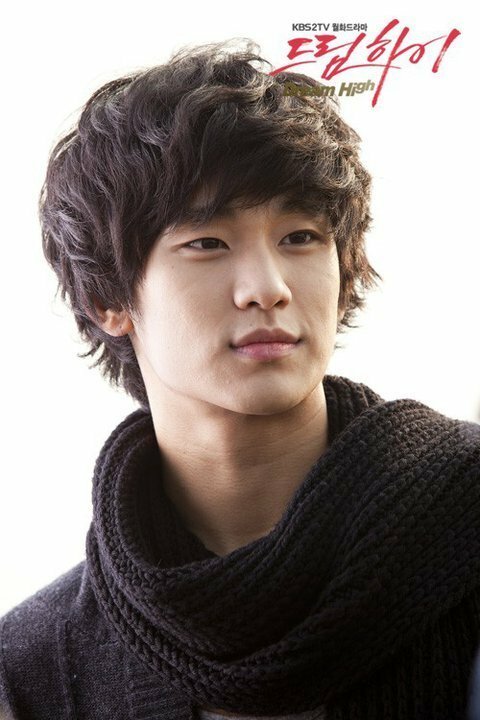 If I didn't know he was a member of 2PM, I would think he was a real actor and not a singer. The beginning was boring. I didn't feel the story until episode 5. I wanted to fast forward the entire episode and I wasn't really into it until episode 5 where they performed SNSD's "Genie". The reason why I watched this was Taecyeon but I came to hate him a little when he sung with Baek Hee on the showcase and totally neglected his group. He promised Hye Mi that he wanted he to be the first person he goes on the stage with but he didn't keep that promise. And for me, for whatever reason may come, a promise is always a promise. I hope readers don't mind if I compare this to New Moon. Some of you may have liked New Moon but I didn't. So I am putting this point under the scenes that I didn't like. Remember when Jin Gook debuted and was gone for half a year due to his tight schedule? That was the time when Hye Mi and Sam Dong got closer. They were the best of friends but then Jin Gook came back. That scene totally reminded me of New Moon. So, Edward left Bella...Bella got real close with Jacob..then Edward enters the scene again to get Bella's heart back from Jacob...Jacob is devastated and heart broken. That's how I felt watching the scene. It's not that I didn't like Jin Gook coming back to his friends, I just didn't like that it reminded me of the vampire story. I am 8 months behind watching this drama. The first reason why I didn't watch this drama was because I don't really like musicals. (Because I can't sing so I am bitter! ha ha!) Another point was because I think it was overrated. Just because there are famous stars in a drama doesn't make it any good. Well, that's what I thought and they proved me wrong. They gave justice to the drama and I think they did a very good job. All in all I am giving this drama 4/5. I definitely recommend this to people who have hopes and dreams but are struggling and loosing hope. If you are into K-Pop and you follow the stars then this is a must see drama. If you are also an aspiring singer/artist then I highly recommend Dream High!